SMALL PRIVATE RANCH FOR SALE TURNKEY OPERATION! 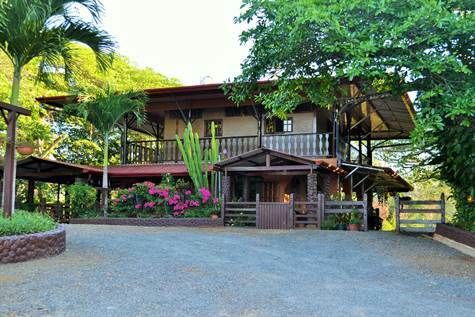 That exceptionnal small private ranch is nestled in the lush green mountains of Chires, Parrita. It sits on a 9 + hectare lot and supports 15-20 horses. At only 2.5 hours south of San José and in between Playa Jaco and Parrita, on the road to Puriscal. The farm offers a full service boarding and training facilities. Roomy stalls all with drains, water hook up, lights & fans, grooming & shoeing area. Tack room with 2 closets for medecine & supplies. 2 story house with 2 bedrooms, 3 baths, kitchen, outdoor & indoor living area, wrap around porches, office. Electric gate at the entrance of the farm. Cowboy house with 2 bedrooms, 1 bath, carport. The property has a river running behiind the farm. 10 pastures + 1/2 hectare of teak. City wáter on site. The owners are constantly upgrading the place. There is also an adjacent lot that comes with the sale and they are currently building a small stud barn on it. The house has a new roof.